Amrita university invites application to the m.tech admissions for the coimbatore and banglore campuses. 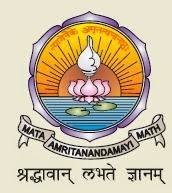 Application forms for admission can be obtained as below:-¨By post, from the Admission Co-ordinator of Amrita Schools of Engineering at Coimbatore or Banglore on a written request indicating their full address together with a Demand Draft for Rs.400/- drawn in favour of “Amrita School of Engineering” payable at Coimbatore. (On the back of the Demand Draft, candidate should write his / her Name). Please keep a photocopy of the Demand Draft with you for future reference). Online Application: Apply through the website olp.amrita.edu/mtech/ and submit the amout online or go for semi Online method where application printout in an A4 sheet along with a demand draft * for Rs.400 (*for semi online Applications only or From the University counter of Amrita School of Engineering at Coimbatore on producing a demand draft for Rs 400/- as above. The world is growing; businesses are expanding and so are the methods to reach the target audiences and the common masses are also increasing. The main motive of every brand today is to reach their target audience with the right message at right time from taking admission in Top Event Management Colleges in Pune.